Postcard showing Memorial High School, located at 151 East Washington Street. The school was constructed by J. C. Hanner in 1922 and dedicated on December 3, 1922. The building was designed in the Spanish Colonial Revival style and was named Memorial High School in honor of the "Orange County Boys who gave their lives in the World War." The building housed Orlando Memorial High School from 1922 to 1927, Memorial Junior High School from 1925 to 1958, and Orlando City Hall in 1961. In 1961, the building was sold to Roland M. Mumford, president of the Meyer Hotel of Jacksonville for $400,077.77. The school was demolished in 1961, and the Robert Meyer Hotel, later named the Kahler Plaza Inn, was erected on the site. In 1973, Harry Helmsley bought it and added it to his chain of Harley hotels. The Harley went into a slow decline under the stewardship of Helmsley's wife Leona, prompting a sort of rock & roll aesthetic to pick up where the Helmsley dynasty left off. The Sheraton eventually picked up the property and injected $9 million into shaping it up. In the early 2000s, Sheraton sold the property and it was renovated once again into a condominium called The Metropolitan. Original 3.5 x 5.5 inch inch color postcard: Private Collection of Thomas Cook. Digital reproduction of original 3.5 x 5.5 inch color postcard. Davis, Orville Rhoads. Education in the Dark Ages: Orlando's Original Junior High Schools Came and Went, What Was It Like Then? Memorial Junior High, 1925-1961; Cherokee Junior High, 1927-1978. Orlando, Fla: Orville R. Davis, 1992. MEMORIAL HIGH SCHOOL ON LAKE EOLA. 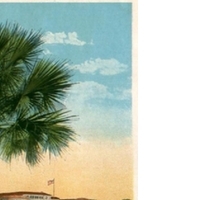 “Memorial High School on Lake Eola Postcard.” RICHES of Central Florida accessed April 21, 2019, https://richesmi.cah.ucf.edu/omeka/items/show/1361.